The evening starts out on a good note — you’re leaving a Thanksgiving Eve church service with your family and heading home to prepare for tomorrow’s big meal. That’s when you notice the other car in your lane. Before you have time to react, it’s too late. You’re hit by a drunk driver through no fault of your own. In Pennsylvania, non-drinking drivers, passengers and pedestrians, hit by a drunk driver numbered 297 in 2016 (the most recent report available). This decreased significantly from 345 the year prior. While it’s good news to see this number decreasing, we hope for a day when no innocent person is hit by a drunk driver. Additionally, these numbers only account for fatalities and do not include the bodily injuries that can change a life forever. The highest number of alcohol-related crashes in Pennsylvania occur during the Thanksgiving holiday. In 2016, 433 alcohol-related crashes occurred from Thanksgiving Eve to Black Friday. In comparison, only 263 crashes occurred during the New Year holiday. Alcohol-related crashes in Pennsylvania occur most often at night. In 2016, 73 percent occurred from 8 p.m. to 4 a.m. The majority of drinking drivers in Pennsylvania alcohol-related crashes are ages 21 to 25, followed by ages 26 to 30 and ages 31 to 35. These age groups accounted for 5,052 alcohol-related crashes; the remaining age groups combined (younger than 21 and older than 36) accounted for 4,945 in 2016. The majority of drinking drivers in Pennsylvania alcohol-related crashes across age groups are male. In 2016, approximately 3 out of 4 drinking drivers were male. The majority of Pennsylvanians who pass away from alcohol-related crashes are the drinking drivers themselves. In 2016, there were 245 driver and passenger fatalities in alcohol-related crashes; of those, 176 were the drinking drivers. Wear your seatbelt. It’s your No. 1 defense if you collide with a drunk driver. If you notice someone swerving and/or slowing and speeding up repeatedly, keep your vehicle as far away from it as possible and call 9-1-1. If possible, relay license plate information and describe the car in detail to the dispatcher. Use extra caution at intersections, where many alcohol-related crashes occur when a drunk driver fails to obey traffic signals or stop signs. Even if you have a green light, make sure to look both ways before entering the intersection. Participate in checkpoints and do not warn friends of them. They are in place to help save lives. If your friend is drinking and driving, it would be better if he or she is caught. Make a mental note of exactly where you are at all times — street name or route number — and either the block number or mile marker in case you need to call the police and report a drunk driver or an accident. 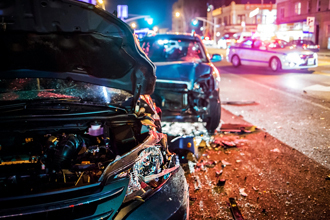 If you or a loved one has been involved in an alcohol-related crash, you may need a personal injury lawyer to assist you in your case. Contact KBG, and our experienced personal injury lawyers will help you and your family to recover.